Relay I/O Board is widely used in applications of smart home project. In this article, I will detail how to control the Relay I/O board using Raspberry Pi with Raspberry Pi Universal Expansion Board via internet. The codes and schematic diagrams used in this article was listed at the end of this article. 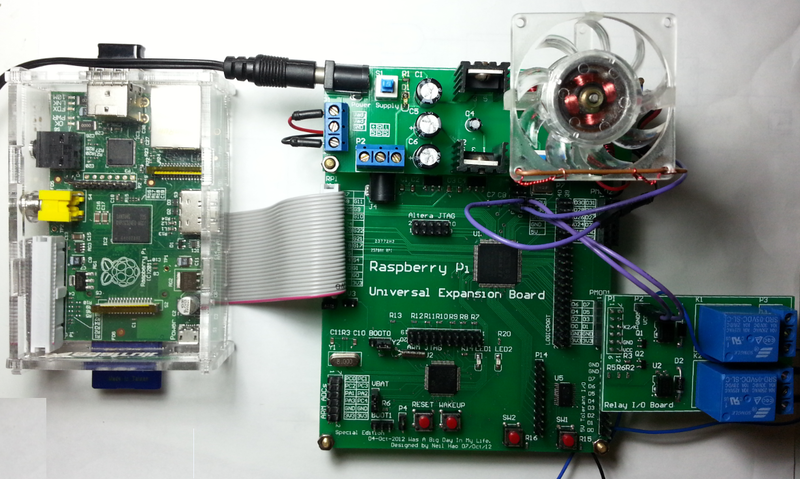 The CPLD on the Raspberry Pi Universal Expansion Board can be used to map pins between modules. For this project, we want to map pins as following diagram Fig.1. For convenience, the Firmware STM32_Relay_1.0.hex needs to be flashed into the MCU. The Firmware will host a Command Shell on UART1. It also includes the driver of the Relay I/O board. Connecting Relay I/O Board to the Pmod1 socket on the Raspberry Pi Universal Expansion Board. A cooling fan may be controlled by the relay as following figure. Try k1on, k1off, k2on and k2off commands to control the relays. 1. Web API Design In above section, a batch of commands was implemented which could control the relay I/O board via UART port. Typically, the UART port is only reachable locally, but our plan is controlling the relays through internet, thus we need to design a Web API using CGI and python, this Web API will act as a bridge between internet and local UART port. kXoff kXon Note: X is the number of the corresponding relay. This API accept two parameters k and state. k is the number of the relay, it can be assigned to k1 or k2. state can be assigned to on, off or query. When state is assigned to on or off, the corresponding relay will be turned on or turned off. When state is assigned to query, the current state of the corresponding relay will be returned. e.g. : cgi/relaycfg.py?k=k2&state=off cgi/relaycfg.py?k=k2&state=on cgi/relaycfg.py?k=k2&state=query Or The source code of this API was provided in Part III. The UI was implemented using jQuery mobile and AJAX technology. cgi/relaycfg.py?k=k2&state=query will be executed just after the DOM is fully loaded. 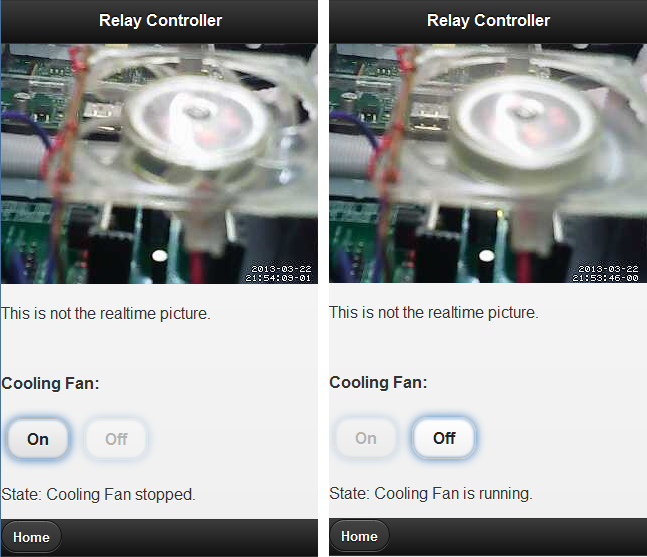 This operation will return the current status of relay k2 (Cooling Fan). The buttons will be enabled or disabled and the State will also be updated according to the current status of k2. The buttons will be enabled or disabled and the State will also be updated during the operation. The source code of this UI design was provided in Part III.